Gopro Hero 3 Camera Camcorder Black Edition With Battery CHDHX-301 Black. DECENT FEATURES of the GoPro HERO3 Black Edition Adventure Camera Wearable, mountable design Immersive, wide angle capture of your favorite activities Professional quality HD video and 12MP photos Built-in Wi-Fi enables remote control Included Wi-Fi Remote or live video preview and remote control on smartphones and tablets running the free GoPro app Rugged housing is waterproof to 197ft/60M and captures sharp images above and below water Compatible with all GoPro mounts for attaching to gear, body, helmets, vehicles and more Compatible with LCD Touch BacPac and second generation Battery BacPac Backwards compatible with older generation BacPacs Video looping Continuous photo Simultaneous photo video Protune, manual white balance controls and more What's Included HERO3 Black Edition Camera 197' / 60m Waterproof Housing Wi-Fi Remote Wi-Fi Remote Key Ring Remote Charging Cable Rechargeable Li-ion Battery QR Buckle, J-Hook, 3-way Pivot 1 Curved 1 Flat Adhesive Mount Assorted Mounts and Hardware The SPECS of the GoPro HERO3 Black Edition Adventure Camera Professional 4k Cinema 12/2.7k Cinema 30/1440p 48 fps/1080p 60 fps/960p 100 fps/720p 120 fps/WVGA 240 fps and more video capture 12MP photo capture with 30 fps burst Wi-Fi Built-In Wi-Fi Remote Compatible (included) GoPro App Compatible (FREE) Professional Low-Light Performance 197' / 60m Waterproof Housing Assorted mounts and hardware included for attaching to helmets, gear and more Single Unit: Dims 3.94 x 3.94 x 9.65" Single Unit: Dims 10 x 10 x 24.5 cm Inner Pack(6): Dims 9.06 x 13 x 10.8" Inner Pack(6): Dims 23 x 33 x 27.5 cm Single Unit: Weight 19.29 oz / 547 g This item is NOT eligible for High Altitude Rewards Point bonuses, Rewards Promotions, or Affiliate Cash Back. Please don't hate us. This product can only be shipped within the United States. Please don't hate us. Born from a passion to capture your adventures from your perspective, the completely redesigned HERO3: Editions line of cameras are the most advanced GoPro cameras, ever. Shockproof and waterproof to 197' (60m), and proven in heavy surf from Tahiti to Northern California and everywhere in between, GoPro cameras can handle it thanks their highly engineered polycarbonate exoskeletal housing. Ready for action—from scuba diving to dirt track racing, and tough enough to take a spin across the asphalt or launch into space, GoPros are built to take a beating and keep filming. Replacement lens kits and housings are available, so there’s little worry while going for glory—even while diving with sharks. GoPro mounts enable you to capture a fully immersive experience of your most exciting moments while ensuring your camera is securely attached and with you for the ride. Helmets, poles, boards, vehicles—and even yourself—whatever you’re into, there’s a GoPro camera mount that will help you get the perfect angle and POV for your most epic adventures. The HERO3 comes with a few basic mounts to get you started. HERO3: The Most Advanced GoPro, Ever. Weighing in at a scant 2.6 ounces, the HERO3: Black Edition is 25% lighter and 30% smaller than previous models. The HERO3: Black Edition's photo performance is 3X improved, now boasting 12MP burst capture at a staggering 30 frames per second with 2X better low light performance compared to previous models. Still Photo and Time-lapse Photo modes remain the same but are now joined by a new Continuous Photo mode that captures continuous 12MP stills at a steady 3, 5, or 10 photo-per-second rate, up to 30 photos at a time. The HERO3's reduced-distortion, 6-element aspherical lens combines with user-selectable Ultra-wide, Medium and Narrow field-of-views to deliver more perspective-capture options than ever before. Add the totally updated flat-lens waterproof housing that delivers stunning image sharpness both above and below water and you've got one of the most powerful and durable image capture solutions on the planet. Understanding that sound quality is as important as image quality, GoPro engineers completely redesigned the HERO3 to be as adept at capturing the subtle, natural sounds of voice and music as it is at capturing the immersive sounds of sport. Also improved is GoPro's already famous wind-noise reduction, ensuring that you'll hear more of your passion, be it your engine or expletives, and less of the wind during high speed activities. Built-in Wi-Fi (Wi-Fi Remote Included)The HERO3 Black Edition features built-in Wi-Fi and includes GoPro's Wi-Fi Remote accessory. The Wi-Fi Remote is normally available as a $79.99 accessory but is included with the HERO3: Black Edition. The Wi-Fi Remote is waterproof, wearable and can control up to 50 Wi-Fi-enabled GoPros at a time from a range of 600'. The HERO3's built in Wi-Fi means it can also be controlled by iOS smartphones and tablets running the GoPro App. A new video mode that unlocks the camera’s full potential, Protune yields stunning image quality and cinema-caliber video for professional productions. Available on the Silver and Black Editions. 35Mbps Data Rate: Provides an improved, less compressed image. Neutral Color Profile: Allows for greater latitude through the color correction process. Log Curve Encoding: Provides more detail in shadows and highlights. Reduced Sharpening and Noise Reduction: Improves flexibility in professional workflows. 24fps Frame Rates: Easily intercut GoPro content with other sources without fps conversion. The GoPro App lets you control your GoPro camera remotely using a smartphone or tablet. Features include full control of all camera settings, live video preview to your smartphone or tablet for easy shot framing and more—Available for free on the Apple App Store™ and Google Play. Get new feature updates, product enhancements and more for your HERO3 through camera software updates. Available at gopro.com/support. Extreme cold temperatures may decrease battery life. For use in these conditions it is suggested to keep camera in a warm place prior to use. To maximize HERO3 battery life when shooting longer duration activities, it’s is best to use camera with LCD Touch BacPac turned off or unattached altogether. Turning off Wi-Fi will also help conserve power. Using protune mode will increase power consumption. May vary per mode and camera edition. Copyright 2019 D&H Camera. All Rights Reserved. 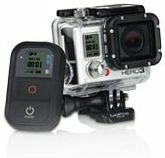 Click the button below to add the Gopro Hero 3 Camera Camcorder Black Edition With Battery CHDHX-301 Black. to your wish list.